Lately it seems Oscar-winning filmmakers Alejandro González Iñárritu (“Birdman”) and Alfonso Cuarón (“Gravity”) — each with the aid of cinematographer Emmanuel “Chivo” Lubezki — have been in a leapfrog contest over the new cinema of total immersion into detailed physical spaces. With “The Revenant,” a revenge saga starring Leonardo DiCaprio as real-life 19th century American frontiersman Hugh Glass, Iñárritu has brought that kind of intensive focus to the uncharted wilderness, and the payoff is a nerve-wracking marvel. 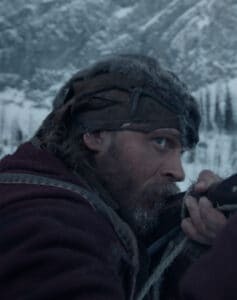 A long, gripping journey through an unforgiving landscape of exploration and brutal survival, “The Revenant” is all the more incredible for not needing 3D glasses or a virtual reality helmet to let moviegoers feel fully dropped into the beautiful, cold, bloody thick of it. Inspired by Michael Punke’s novel, which was itself drawn from a true story, the movie opens on an encampment of fur trappers on the Upper Missouri led by Captain Henry (Domhnall Gleeson). DiCaprio’s gruff Glass is the expedition group’s expert tracker, accompanied by a half-Pawnee son named Hawk (Forrest Goodluck), whom he fiercely protects from the taunts and insinuations of Fitzgerald (Tom Hardy), an ex-soldier only concerned about pelts-for-cash. Though still alive, the torn-up Glass is considered a goner, so Henry tasks Fitzgerald and a young trapper named Bridger (Will Poulter) with staying behind on deathwatch and following through with a proper burial. The mercenary Fitzgerald has other plans, though, abandoning Glass with an act of betrayal so terrible it gives our mauled hero the Herculean will to live, heal, and trudge through a treacherous winter until he can exact his vengeance. 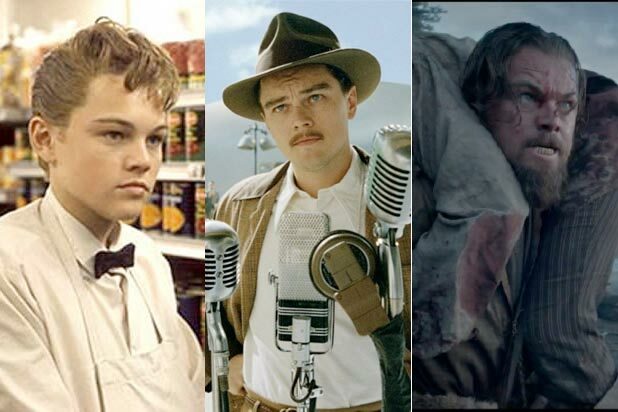 The bearded DiCaprio, long an underrated physical actor, throws himself so completely into Glass’s never-give-up struggle that his scarred wheezes – much like Timothy Spall‘s grunts in “Mr. Turner” – become their own language of sorts. (There’s not a lot of talking to do when no one’s around most of the time.) He’s so convincing as a bear-attack victim driven to animalistic ends that you’ll believe he’d set his own throat on fire with gunpowder to cauterize a wound or, conversely, stick out his tongue to catch a snowflake in a rare moment of restful levity with helpful Indian Hikuc (Arthur Redcloud) whose path he crosses. DiCaprio’s ably matched by Hardy, turning in another of his gristly portraits of wild-eyed ruthlessness. What more is there to say about two-time Oscar-winner Lubezki’s lensing skills that countless moviegoer gasps over the years haven’t already said? “The Revenant,” filmed entirely at magic hour, is in one sense a painterly ode to that brief time when the sun is either newly emergent or eerily on the wane. But there’s more to the visuals than spectacular views (of, in this case, Argentina, Montana and Canada) at optimal moments. 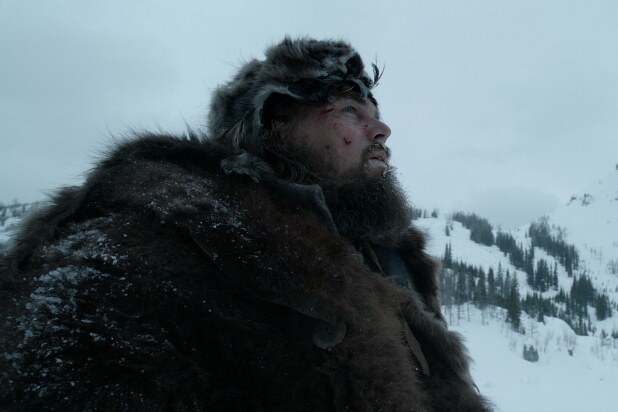 For Iñárritu and Lubezki, the camera is a sinuous probe, which in terrain this merciless makes it one more curious creature assessing every image — Hardy’s cornered-looking, firelit gaze, a frozen clearing marked by thin sunlight, a thick and misty wood dotted with far off movement — as threat or lifeline or source of unimaginable wonder. Consequently, the power of this filmmaking pair, with their unbroken, 360-degree action scenes, is in conveying frontline danger so primal you forget about the virtuosic feats of shot-making choreography involved. The technical achievements extend, too, to veteran production designer Jack Fisk’s evocative frontier structures, Jacqueline West’s richly textured harsh-climate clothing, and the seamless effects work. Credit must also go to the mélange of atmospheric music by the trio of Bryce Dessner, Alva Noto and the great Ryuchi Sakamoto. Is the relentlessness too much? At two and a half hours, perhaps, but inventiveness abounds. Rather than deliver one more triumph-of-the-human-spirit yarn, Iñárritu wisely sticks to the convulsive, hot-breath bleakness of determined endurance. Less successful, in fact, are Iñárritu’s holistic, Malick-ian moments in which Glass hallucinates about his dead Pawnee wife. They reach for consciously arty spirituality when the sheer totality of Glass’s return from death’s door — as gory and violent as it often is — allows “The Revenant,” one of the year’s best pictures, to make cinematic fire and to forge its own strange, rugged, thrilling grace.